In addition to simply supporting the show, Premium subscribers get a special, priority email address direct to John and Dave for help, plus you also earn fun gift rewards for your continued support. Check it out – we'd really appreciate it. 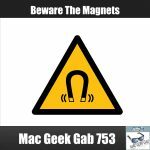 Siri, Stringify, Space Lens, and Emergency Bypass don't all begin with the letter 'S', but they have one thing in common: your two favorite geeks discuss them in this week's episode of Mac Geek Gab. 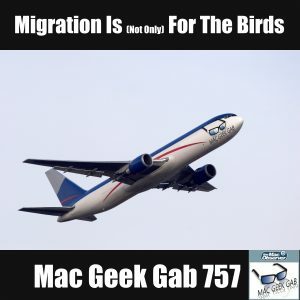 In addition, listen as John F. Braun and Dave Hamilton answer your questions, including some about migrating to a new Mac the right way. The best way. Press play and enjoy learning at least five new things! 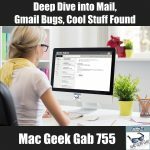 Mail was the Deep Dive topic this week, and then the Gmail/Gsuite/macOS 10.14.4 bug happened, so Mail gets a double dip and you're gonna love it. Then it's on to perhaps the best AirPods alternative we've found... for just $30. More Cool Stuff Found plus your questions answered rounds out the episode. Press play, learn, and enjoy! 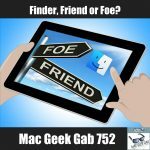 The Finder can be your friend or foe, depends upon how well you tame and tweak it. 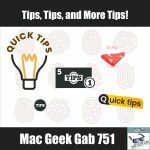 These are the kinds of things John and Dave help you do each week on Mac Geek Gab. 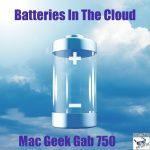 In addition to that, we've got segments on taming iCloud's two-factor authentication, suggestions for improving on the Stickies model, and ways of recovering disk space. All this and more! Just press play and learn at least five new things! Want to learn the big secret to keeping your computer happy? How about how to share contacts? What about some quick tips about using calendar? 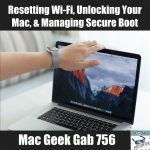 This is what Mac Geek Gab is all about, and Dave and John help guide you through all of this, including getting your questions answered! Aren't using all your iCloud Storage? No worries, we've got an idea for that. We also have Cool Stuff Found and answers to your other questions. Plus, we iterate on a Quick Tip from last episode making it quicker and tipper! Listen with John and Dave and learn at least five new things! Wanna know how to force Safari to download a media file instead of playing it? 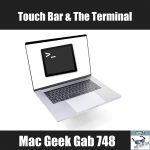 Want to know how to use the same drive on USB-C and USB-A Macs? Want to know how to secure erase your NAS drive? John and Dave have your answers! There is also a lot of concern about the future of eero, so your two geeks discuss that, too. All this and more, just press play and enjoy learning at least five new things! Do you need an elbow connector? 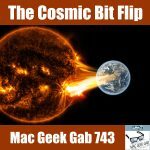 You might after listening to this episode! That, after all, is what Cool Stuff Found segments are all about: discovering stuff you didn't know existed, and now you need! 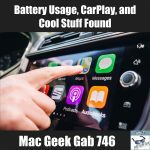 In addition to that, of course, your tips are shared and questions are answered, including some about iCloud Archives, CarPlay, and Watch Notifications. Hosts Dave Hamilton and John F. Braun guide you through all of this and more, just press play and enjoy learning at least five new things! How fast is your connection? How much of that speed matters? How fast is your Mac? Why isn't it faster? What devices can you see on your network? Why can't you connect to all of them? 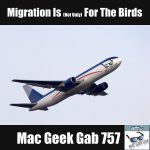 This is what Mac Geek Gab is about. Posing questions, getting answers, and learning at least 5 new things. Learn your 5 now by pressing play! 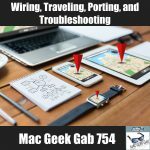 Wanna learn at least five new things about your Mac and iOS devices? 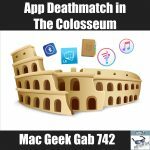 This week's Mac Geek Gab episode is sure to hit the mark. 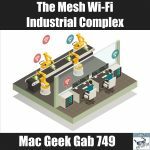 With topics ranging from Quick Look to Car Play to Robot Vacuums to APFS, there's always something new to learn! Press play, download, and enjoy. 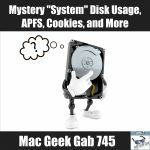 Mysteries are meant to be solved, and when it comes to the mystery that is your "System" disk usage as displayed by macOS, well, that mystery's not even supposed to exist in the first place. Dave and John dig in to solve this plus a bunch of other questions sent in by you, dear listeners. Press play, listen, learn, and enjoy! 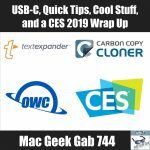 Back from CES 2019, Dave Hamilton and John F. Braun have a few thoughts to share. Then it's on to answering your questions, this time with a focus on things that used to work... and stopped. Press play, listen, and learn! 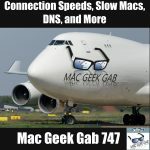 Do you notice your Mac slowing down a lot? How many Contacts do you have? 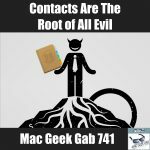 More and more listeners have been writing in with Contacts-related problems and solutions... are you one of them? Listen to John and Dave discuss this and so many other things this Christmas Eve. Press play and enjoy! 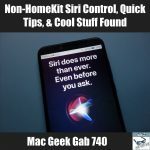 Have you ever wanted to use Siri to control something that's not HomeKit-compatible? You're not alone. Also, you're in luck! John and Dave have an answer for you. On top of that, quick tips, Cool Stuff Found, and your questions answered. Press play and let's go! iOS is wonderful... and mysterious, especially when it asks you to login, or shows you duplicates of your data. Listen to John F. Braun and Dave Hamilton solve these problems and more for you. 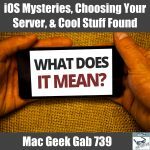 Then, should you get a separate Mac as a server, or can you run in the background? And, of course, more Cool Stuff Found just for you. Press play, listen, learn, and enjoy! 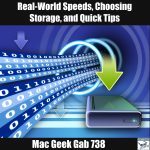 Ever have a disk drive or Wi-Fi device that doesn't get quite the advertised speeds? Yeah, so have we. In fact, it happens all the time. Listen this week as John and Dave discuss the differences between advertised maximums and real-world expectations... and how to translate between the two. Of course, that's not all! More questions and Quick Tips than you can shake a stick at. Press play, download, and enjoy!